It might be best to begin by saying that Şanlıurfa (Glorious Urfa), often shortened to Urfa, is located in southeastern Turkey about 25 miles north of Haran, the home of Abraham before he went to the land of Canaan (Genesis 11:31). Some writers associate Urfa with Ur, the original home of Abraham. Prior to the 19th century scholars generally were unsure of the location of Ur, whether in the north or south of Mesopotamia. Since Leonard Wooley identified a site in southern Mesopotamia (modern Iraq) in the 20th century with Ur of the Chaldeans, that site generally been accepted by most scholars. There have been those, however, who argue that the Biblical Ur should be identified with Urfa, or the general area in northern Mesopotamia. This is a site in modern Turkey, and a region we know as biblical Paddan-Aram (Genesis 25:30, et al. Cyrus H. Gordon argued for this position, and Barry Beitzel places Ur in the north in The Moody Atlas of Bible Lands. Others, such as Rasmussen in Zondervan Atlas of the Bible, acknowledge that some place Ur in the north. I leave this discussion for your further study. Muslim tradition reveres Urfa as the birthplace and early home of Abraham. Abraham is identified prominently among the 28 prophets of the Muslim faith. Much of what is said in the Quran (Koran) about various Old Testament-period characters of the Bible (including Jesus, John the Baptist, and Mary) is taken from the Jewish Talmud and Christian apocrypha — books not accepted as part of the biblical canon. Geisler and Saleeb cite W. St. Clair-Tisdall’s The Sources of Islam to show the direct dependence of some of these stories. Clair-Tisdall’s book is available at Google books. The story of Abraham and the idols is found in Sura 21 of the Quran, but it does not include the legendary story about the fish that we will recount below. Legend had it that Abraham (Ibrahim), a great Islamic prophet, was in old Urfa destroying pagan gods one day when Nimrod, the local Assyrian king, took offence at this rash behaviour. Nimrod had Abraham immolated on a funeral pyre, but God turned the fire into water and the burning coals into fish. Abraham himself was hurled into the air from the hill where the fortress stands, but landed safely in a bed of roses. The picturesque Gölbaşhi area of Urfa is a symbolic re-creation of this story. Two rectangular pools of water (Bahkll Göl and Ayn-i Zeliha) are filled with supposedly sacred carp, while the area west of the Hasan Padisah Camii is a gorgeous rose garden. Local legend has it that anyone catching the carp will go blind. Consequently, these appear to be the most pampered, portly fish in Turkey. (p. 565). As with many “Jewish” and “Christian” sites we speak of the traditional location of this or that. Sometimes, when there is little evidence to suggest the historical nature of such, we refer to something as a legendary account. Such would be the case with this story of Abraham and Nimrod. Şanlıurfa is a beautiful small city and a pleasure to visit. I have had the opportunity to do so three times. The Gölbaşhi park in the historic area is easy to visit. 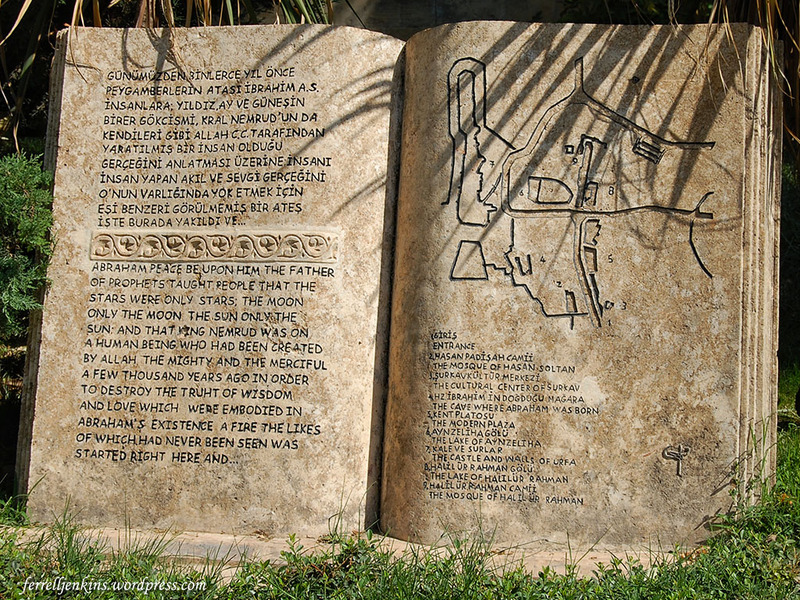 Our photo below shows a plan of the area on one side and the aforementioned story of Abraham on the other. The legend of Abraham’s association with Urfa. Photo by Ferrell Jenkins. Pool in the Gölbaşhi area of Urfa. My friend Gene, wearing the Florida State shirt and holding the camera at ready, bought extra bowls of food for the little boy so we could get photos of him feeding the fish. 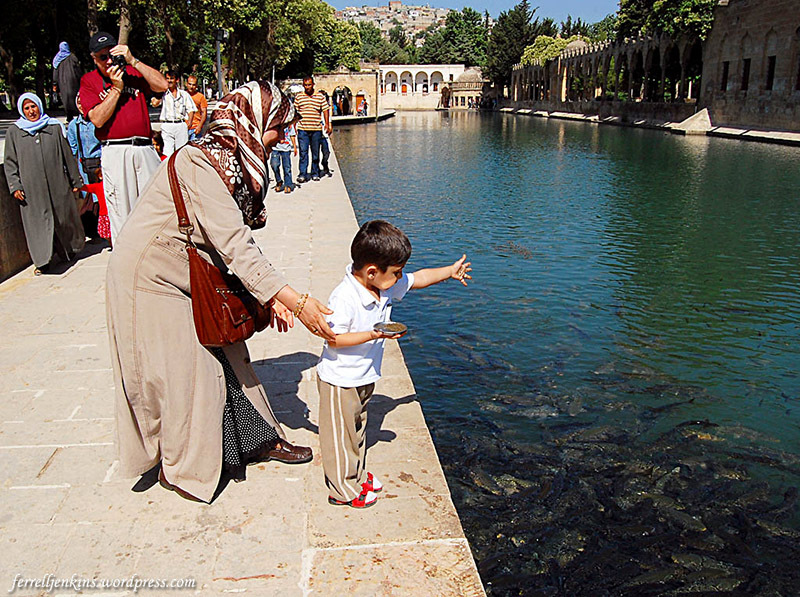 Children enjoy feeding the sacred carp in the pool. Photo by Ferrell Jenkins. 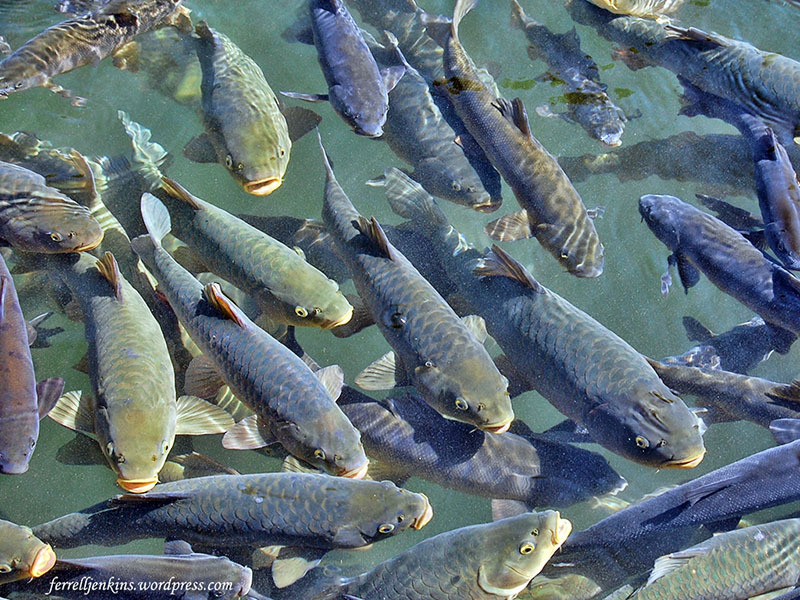 The sacred carp of Urfa rush to get the food. Photo by Ferrell Jenkins. A word of explanation is in order. I had never met a Muslim until my first trip to the Bible lands in 1967. In Cairo, Egypt, we sat on the floor of the Mohammad Ali mosque and listened as our guide explained about the mosque and the Muslim religion. He then answered as many questions as we wanted to ask. Through the past half century I have made many friends among the Muslims, including visiting in some homes, and I have had the opportunity to travel widely in the Middle East. I have good Muslim neighbors. In Part 2 we will visit the cave identified as the birthplace of Abraham. 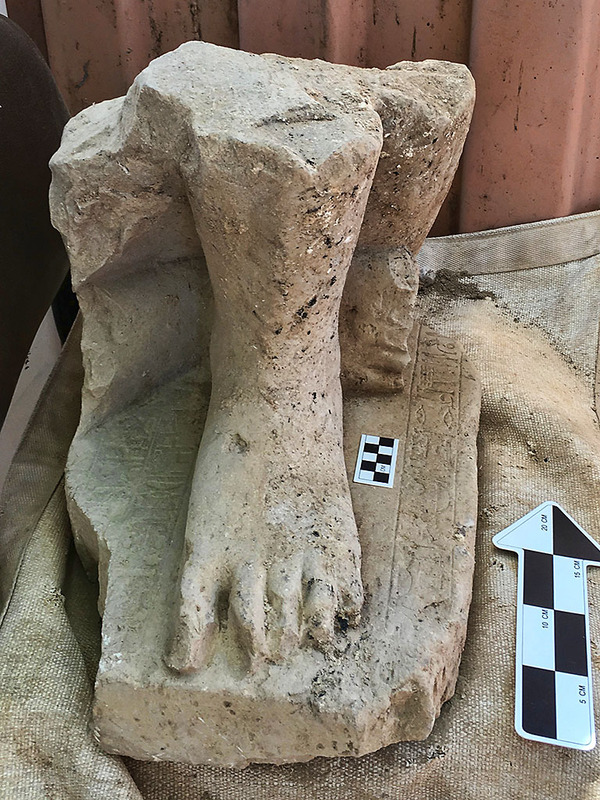 Hebrew University announces this morning the discovery of a statue of an Egyptian official at Tel Hazor. 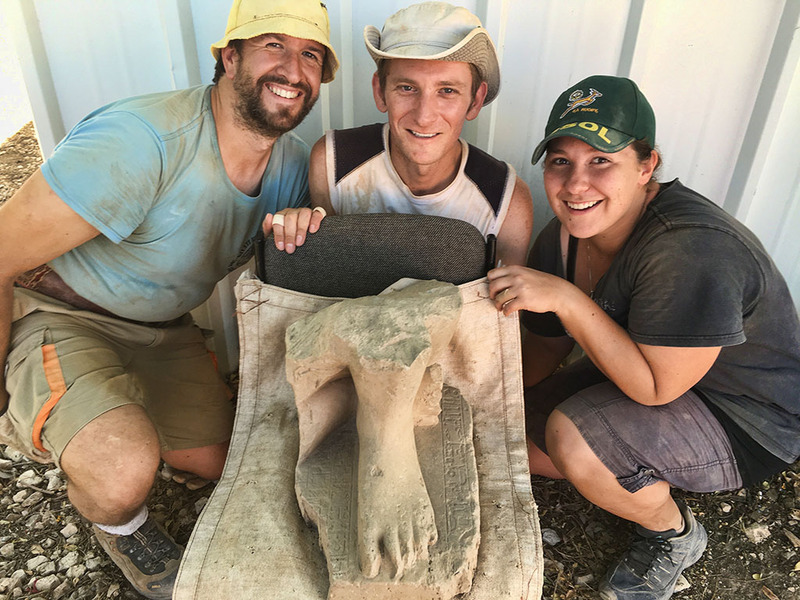 Jerusalem, July 25, 2016 — In a historic find, a large fragment of an Egyptian statue measuring 45 X 40 centimeters [about 18 x 16 inches], made of lime-stone, was discovered in the course of the current season of excavations at Tel-Hazor, north of the Sea of Galilee in Israel. Only the lower part of the statue survived, depicting the crouching feet of a male figure, seated on a square base on which a few lines in the Egyptian hieroglyphic script are inscribed. The archaeological season for the major excavations is closing down and interesting reports are coming in almost daily. 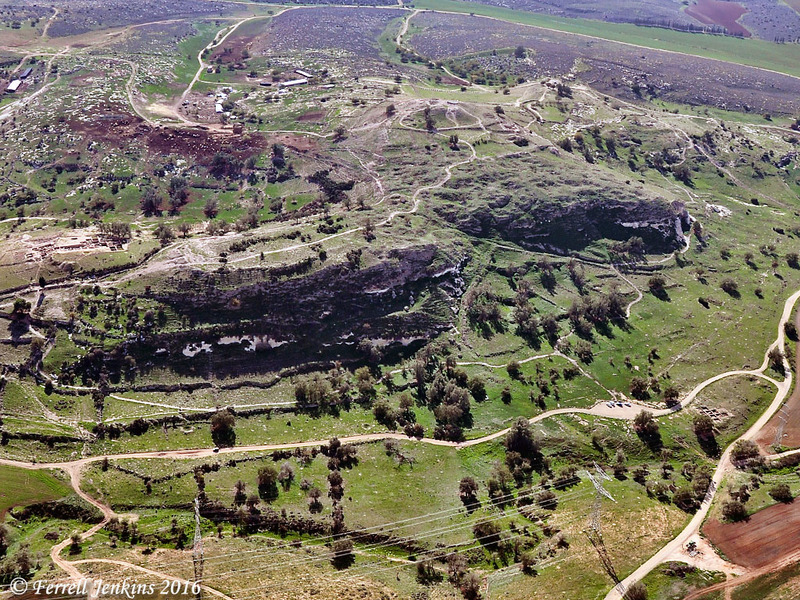 Tel Hazor (upper mound) from the south. Photo by Ferrell Jenkins. Great article! Some of your readers might be interested in the “crown of thorns” that I have posted on my web site. 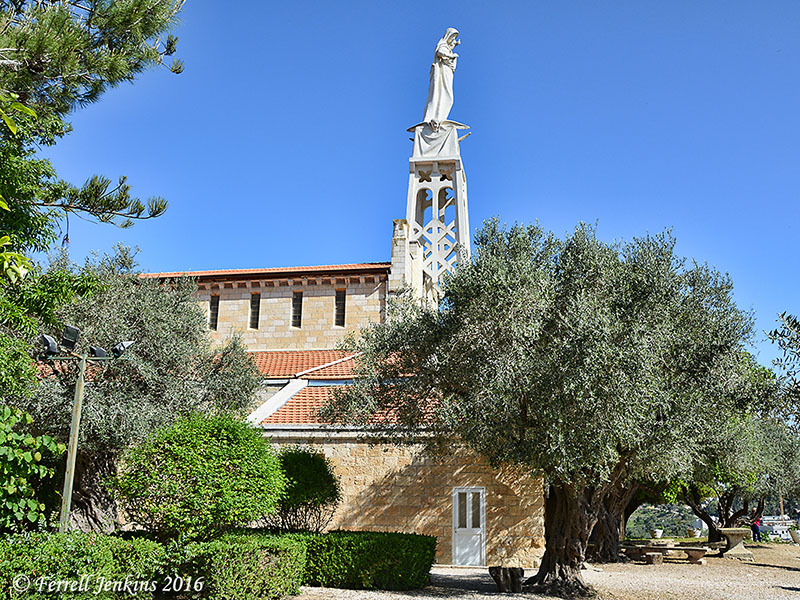 He left a link to a beautiful example of a crown of thorns posted at holylandphotos here. This photo, along with those we posted, will certainly enrich any lesson on the subject. And this gives me the opportunity of share a Jerusalem experience from this spring. It was the first time Carl and I had met in person, but we had exchanged several emails and assisted each other in locating some significant places in the Bible world over the past few years. Carl was on his first outing with a new class of students at the Jerusalem University College. We didn’t have much time to talk, but enough to pose for a photo beside the south wall of the Old City. 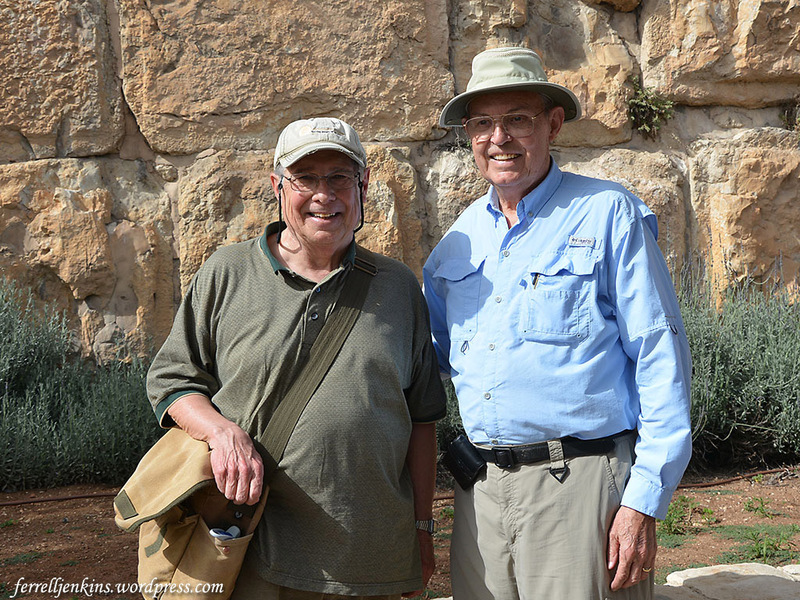 Carl Rasmussen and Ferrell Jenkins in Jerusalem. April 5, 2016. 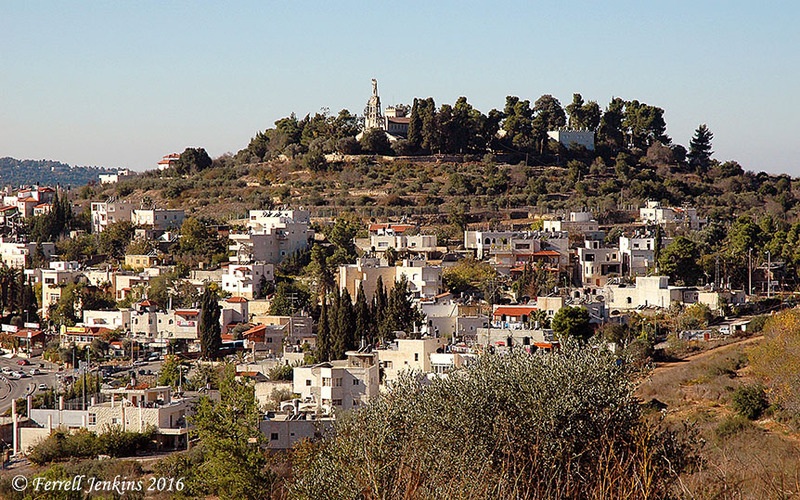 Prof. Carl Rasmussen is known for his academic teaching, his tours, and his Bible atlas, his Holy Land Photos’ blog, and his large collection of photos at holylandphotos. We have called attention to the Zondervan Atlas of the Bible several times. I recommend this book for home study, and the Zondervan Essential Atlas of the Bible to use when traveling to Bible lands, or to take to Bible class. I see that Kindle currently has this book for $12.96. The Holy Land Photos site now has a database of more than 4700 photos available for use by teachers. I have developed friendships with several individuals who are recognized for their interest and knowledge in Bible lands as a result of this blog. A wonderful side benefit to this work. Sunday I was reading this text from Matthew prior to the Communion/Lord’s Supper. Immediately I thought about sharing photos of the “thorns” his tormentors put on the head of Jesus and the “reed” they put in his right hand. 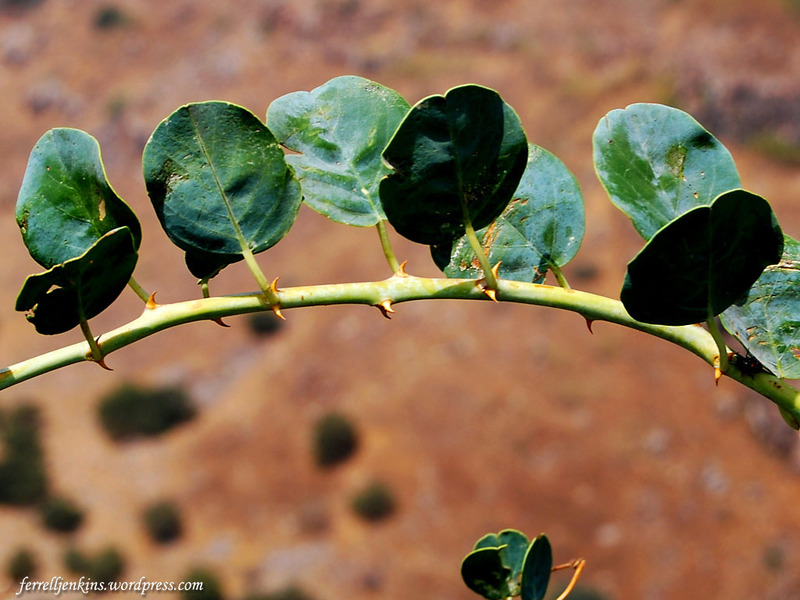 There are several possible plants growing in Israel that would be suitable for a crown of thorns. The United Bible Societies Fauna and Flora of the Bible has this comment. 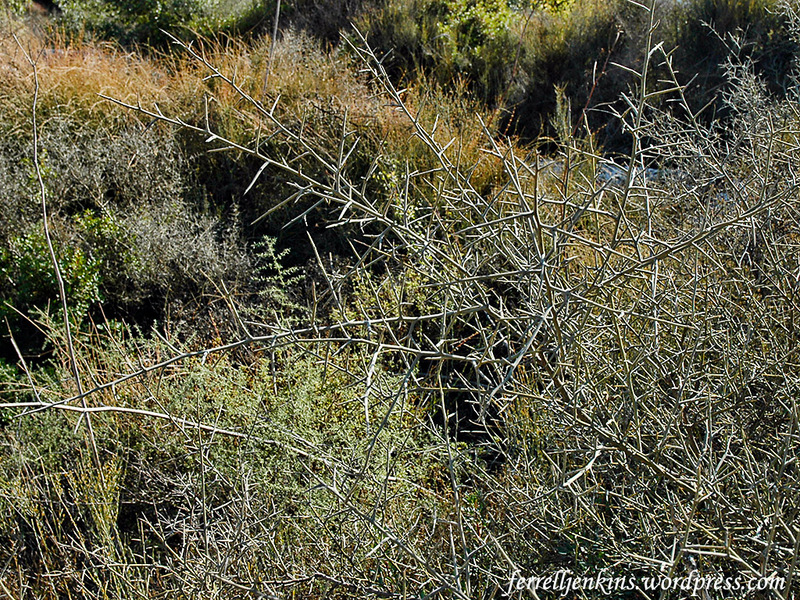 The photo below shows the ziziphus spina-christi growing at Gamla in Galilee. The thorn (ziziphus spina-christi) growing at Gamla. Photo by Ferrell Jenkins. I think the following photo made at Neot Kedumim shows the Thorny burnet (Poterium spinosum). You can see several examples, some in bloom, in the Pictorial Library of Bible Lands, Vol. 16 (Trees, Plants and Flowers). Thorns growing at Neot Kedumim. Photo by Ferrell Jenkins. Here is a drawing from UBS’s 1000 Bible Images. 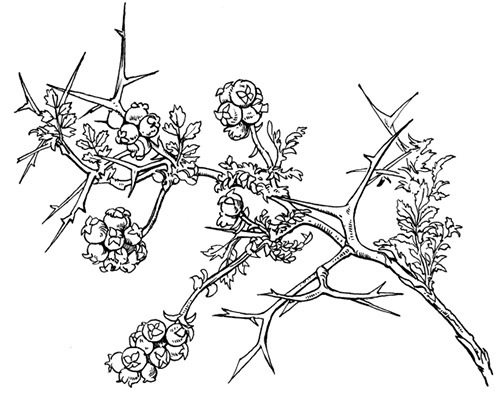 I have observed several thorn plants with long spikes such as these. Thorny burnet. 1000 Bible Images. 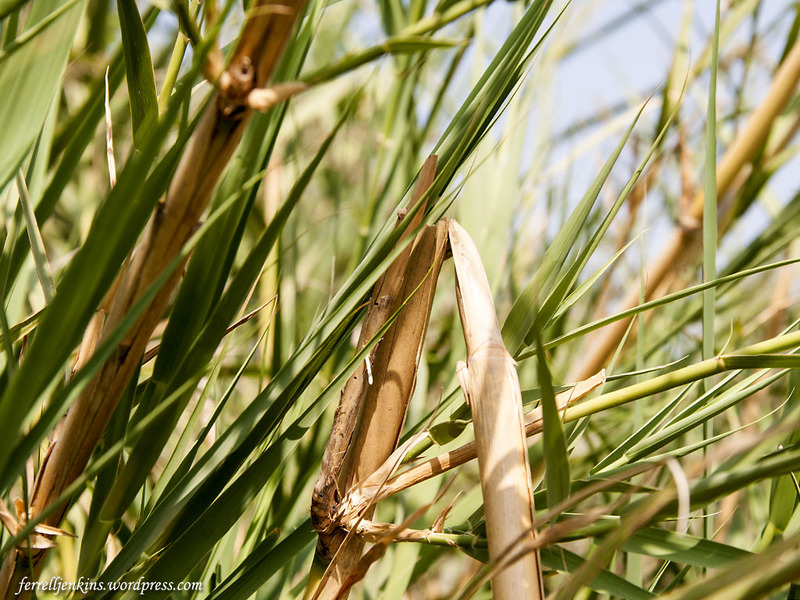 Reeds grow commonly around streams and in marshy areas. 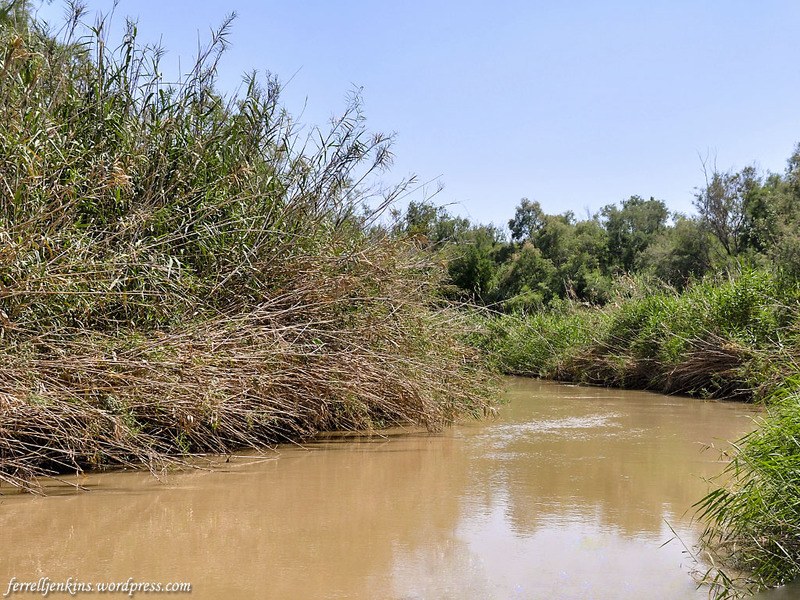 Reeds can be seen in abundance along the banks of the Jordan River at Qasr el-Yahud, the traditional site of the baptism of Jesus (Matthew 3:13-17). Reeds growing on the banks of the Jordan River. Photo by Ferrell Jenkins. The final photo is a close-up of reeds growing in a marshy area near Omrit in the northern Hula Valley. Reeds growing in a marshy area near Omrit in northern Israel. Photo by Ferrell Jenkins. The reed was first used as an instrument of mockery, as if it were a scepter, and then as an instrument of punishment with which to beat Him. Recently we called attention to significant biblical events that took place at Joppa. One of these was the account of Jonah taking a ship for Tarshish from Joppa to avoid going to Nineveh (Jonah 1:3). The folks at Joppa (Jaffa; Yafo) have not forgotten what happened to Jonah. 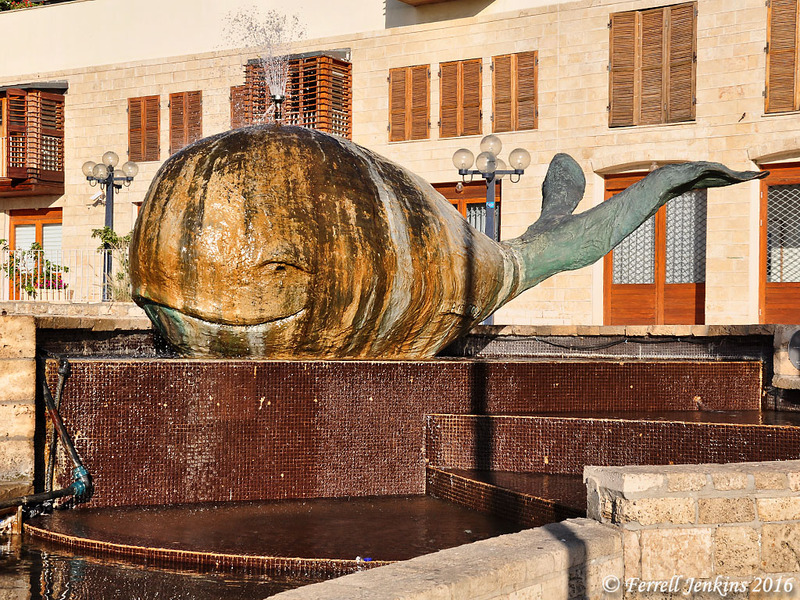 Visitors to Joppa (Jaffa; Yafo) are reminded of the story of Jonah and the great fish. The NET Bible uses the phrase huge fish. The New Testament accounts of Jesus’ reference to this event use the phrase “great fish” or “sea monster” in Matthew 12:40 and Luke 11:29-30. Of the commonly used English versions, only the King James Version makes reference to a whale. Tell es-Safi/Gath. 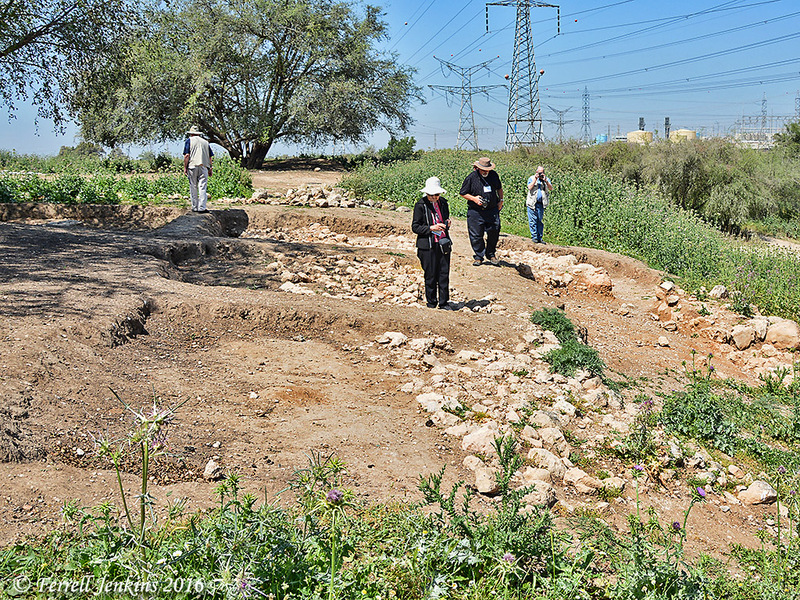 Prof. Aren Maeir continues to report almost daily about progress in the excavation at Tell es-Safi/Gath. Staff and volunteers are working in at least five areas and Maeir continues to give a brief summary of finds of the dig with multiple photos here. The photos are not labeled, but if you know something about the site you may be able to determine which area is pictured. Since the announcement at the close of last season (2015) about a possible Iron Age gate, and the teaser post with 1 Samuel 21:13 as a title, I have been following this. I am not expecting they will find David’s spittle or a hair from his beard, but as a believer of the Biblical account I do draw a connection between the text and the factual reality that seems to be coming to light on the tell. Below is an aerial photo published last year showing the gate area of Gath. For a larger photo go to the Gath website here. Aerial general view of area D fortifications at Gath. Area D, with the gate and fortifications, is located below the parking area visible in the lower right quarter of the photo. 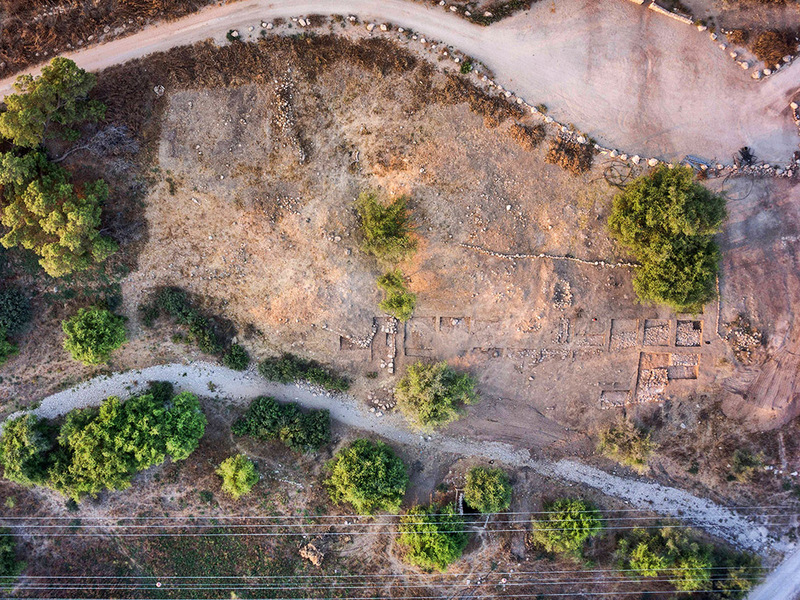 Aerial view of Gath showing the area where the gate has been uncovered. Photo by Ferrell Jenkins. Earlier this year when my group visited the site in April, some of the tour members enjoyed examining the stone walls. I am looking forward to seeing new photos at the end of this season (in about a week). It only takes a short time after the rains for new growth to begin to cover the excavations. Members of my group looking at the walls uncovered in 2015. Photo by Ferrell Jenkins. 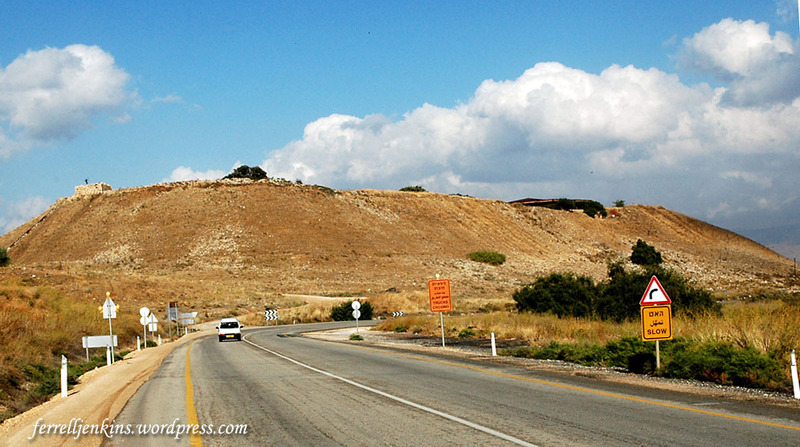 David’s relationship with the Philistines is fascinating. At the Valley of Elah, a few miles away, he killed the giant Goliath who was from Gath (1 Samuel 17), but later, when fleeing from King Saul he sought refuge from Achish king of Gath. It was at that time that David “pretended to be insane” at the gate of Gath. 10 And David rose and fled that day from Saul and went to Achish the king of Gath. 11 And the servants of Achish said to him, “Is not this David the king of the land? Did they not sing to one another of him in dances, ‘Saul has struck down his thousands, and David his ten thousands’?” 12 And David took these words to heart and was much afraid of Achish the king of Gath. 13 So he changed his behavior before them and pretended to be insane in their hands and made marks on the doors of the gate and let his spittle run down his beard. 14 Then Achish said to his servants, “Behold, you see the man is mad. Why then have you brought him to me? 15 Do I lack madmen, that you have brought this fellow to behave as a madman in my presence? Shall this fellow come into my house?” (1 Samuel 21:10-15 ESV). Read here for my more detailed post about Gath and the possible gate from last year. Thanks to Aren Maeir for the good updates and photos from Gath. Follow his blog to read more about it.